What Are Vortex Shedding Flowmeters? Vortex shedding flowmeters are a type of flowmeter available to the process industry for the consistent evaluation of flow rates. These flowmeters measure the volumetric flow rate of media such as steam flowing in pipes, gases, and low viscosity liquids, boasting both versatility and dependability. Since they have no moving parts, they are virtually impervious to wear. A "shedder" bar (also known as a bluff body) in the path of the flowing fluid produces flow disturbances called vortices. The resulting vortex trail is predictable and proportional to the fluid flow rate. This phenomena is know as the "Von Kármán vortex street" (see illustrations to the right). Sensitive electronic sensors downstream of the shedder bar measures the frequency of the vortices and produce a small electrical pulse with every vortex created. The electrical pulses also also proportional to fluid velocity and is the basis for calculating a volumetric flow rate, using the cross sectional area of the flow measuring device. 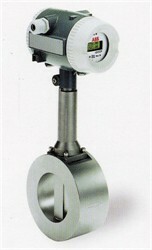 For more information on any type of industrial flowmeter, visit https://www.teco-inc.com or call 800-528-8997.